Incorporating exercise into your daily routine has countless benefits for people of all ages, such as a healthier heart, stronger bones, improved flexibility and maintaining an ideal weight. 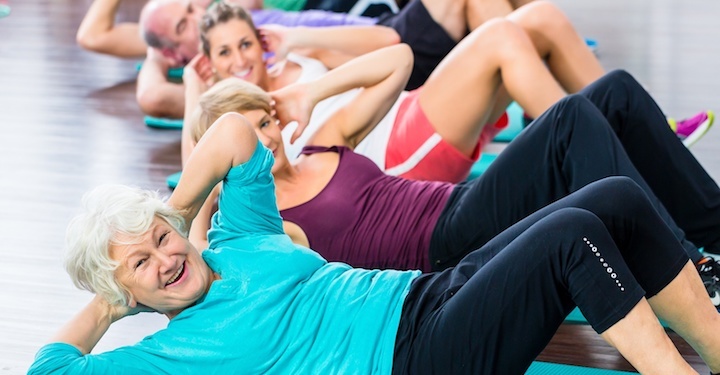 For older adults, exercise offers even more long-term health benefits. For instance, seniors who stay physically active feel more energetic, experience less chronic pain, have a decreased risk for falls and even enjoy improved mental and emotional health. By the time adults enter their forties they can expect to lose three-to-five percent of their overall muscle mass with each subsequent decade of life. It’s common to lose flexibility and range of motion, as well as endure pain from chronic conditions like arthritis or osteoporosis. Plus, recent studies suggest that around 67 percent of people age 65 and older tend to live a sedentary lifestyle, with periods of inactivity throughout the day lasting as long as eight hours. Sitting in one spot for these long lengths of time only further weakens muscles and bones. Exercising regularly is key to preserving your health and independence. Exercise helps you manage and even alleviates pain from many chronic conditions, decreases the need to take a variety of medications, and improves the quality of your sleep – all of which contributes to better quality of life. Exercise doesn’t have to be a chore! And, it’s never too late to get active. Talk to your doctor first to get clearance before getting started, especially if you have any pre-existing conditions that could threaten your health. Once you find an activity or a senior fitness program that’s right for you, you may find yourself looking forward to your daily workout. There are activities seniors of all ability levels can enjoy, from swimming and walking to chair yoga and more. Falls are the number one cause of injuries, both fatal and nonfatal, in older adults. Incorporating balance exercises into your daily routine can reduce risk of those falls caused by arthritis, low or high blood pressure, heart disease or medication side effects. Daily stretching can improve flexibility, decrease the amount of energy needed to complete movement and help prevent future injury. Staying limber and flexible as you age can help increase your range of motion and make everyday tasks easier. Strength-training exercises focus on building and retaining muscle mass while also reducing chronic pain. When practicing strength exercises, it is important to work different muscle groups each day. For example, if you begin with legs one day, you should move to arm or core exercises the next day to avoid overworking any one muscle group. Every movement you make is generated from your core. This includes the muscles in your back, abdomen, and along your spine, hip and pelvis. Incorporating core exercises into your workout routine is key to avoiding injuries from falls, poor balance or limited mobility. If you have limited mobility, chair exercises offer a perfect way to incorporate physical activity into your daily routine. All the exercises listed above can be modified into seated exercises. Chair exercises can build and tone muscle, lubricate joints and increase blood circulation by working the legs, arms and core. At Immanuel Lutheran Communities, we focus on all six dimensions of wellness through a variety of healthy activities for residents. For your physical health, you’ll enjoy access to daily fitness classes designed with the specific needs of seniors in mind. Improve your strength and balance, try yoga or even dance your cares away in a line dancing class. Contact us to learn more about our Kalispell retirement community located in the beautiful Flathead Valley, or view our floor plans to start planning for your future today.